DJ Spice, since age 3 has been a proficient DJ with the influences of his father the late DJ Rocking Mills Brothers Disco, hip hop dj’s Red Alert, Grand Master Flash, Kid Capri, Mr. Cee, Caribbean dj’s, Mad Man Maddy, the late Glenn Brathwaite (DJ GB Productions), the late Super Jock Tan Tan, Rennie Bishop (WWRL 1600AM New York Radio) and his grandfather Trinidad All-Stars pioneer; Neville Jules. DJ Spice is one of the first Caribbean djs in the United States to only play cd’s in a party/radio and has taken his name to high levels spinning the best in old and new Soca, Reggae, Latin, Salsa, Meringue, Hip Hop, R&B Classics, House; entertaining audiences all over the world from England to California, Chicago, Ohio, Miami, Boston, Atlanta, Toronto, Montreal, Canada, and all over the Caribbean. He has managed and hosted shows on the PACE University New York City Radio Station (WPUB 640AM); Spinned on WNWK 105.9FM Drive-time Show Monday-Friday 6-7 PM and also spinned on WWRL 1600 AM radio for Rennie Bishop. 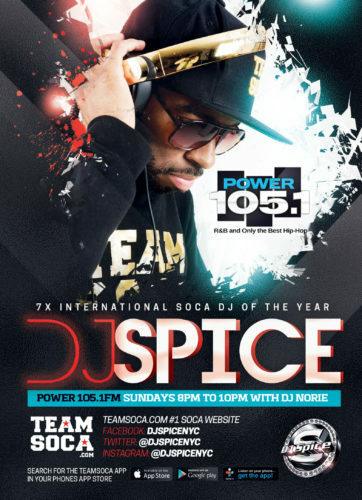 You can catch DJ Spice with the soca mix on DJ Norie’s show “Anything Goes-Caribbean Edition”Sundays 8pm to 10pm on Power 105.1fm NYC. 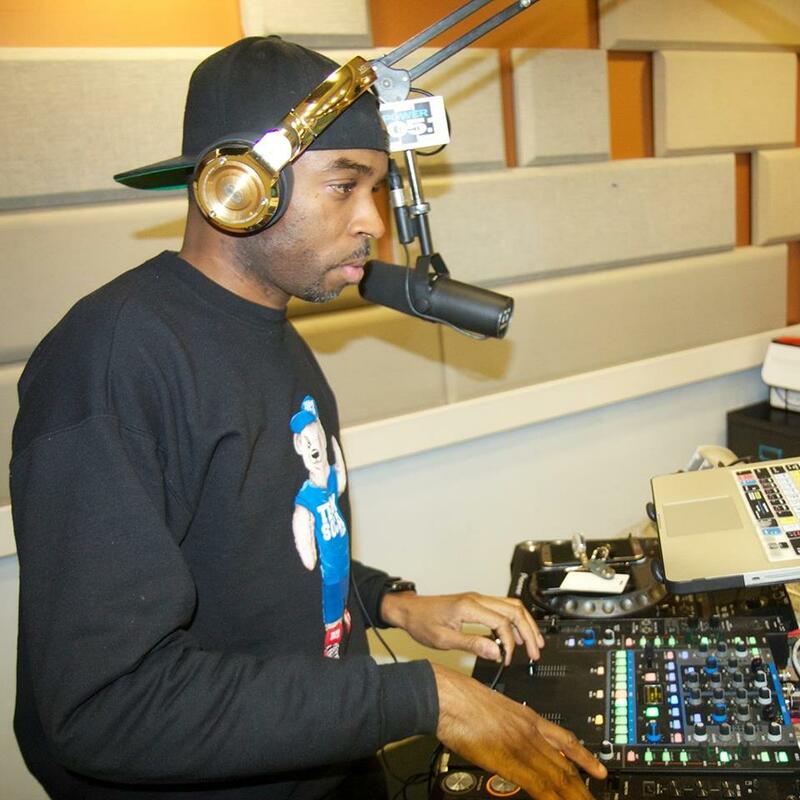 DJ Spice currently plays around the world promoting Soca and Calypso, the music of his country Trinidad and Tobago. When in Trinidad, you can find him on the Slam 100.5fm & vibe ct 105.1 fm, and in New York City you can find him at various clubs in Brooklyn, Manhattan, Queens (Tri-state area). DJ Spice is the creator of TeamSoca.com; the #1 Soca radiostation & clothing line in the world and the CEO of the Mills Brothers Sound System DJ Service. The Mills Brothers Sound System is a full service disc jockey entertainment company providing entertainment for the world with over 40 years in the business. This sound system company is home of NY’s #1 awarded Caribbean DJ SPICE & NY’s # 1 MC WASSY. We have entertained audiences all over the world from London , England to California , Chicago , Ohio , Miami , Boston , Atlanta , Toronto , Montreal, Canada , and all over the Caribbean . Mills Brothers Sound System provides experienced dj’s spinning the best in old and new Soca, Reggae, Latin, Salsa, Merengue, Hip Hop, R&B Classics, and House etc. We are available for weddings, parties, social events, shows, parades, concerts, radio shows etc and is a proud member of the National Association of Mobile Entertainers (NAME). Contact us today at bookings@spiceinyourlife.com or log on to www.spiceinyourlife.com for a night to remember!! !